After 15 years without a PPG wave I bought one again. It was a great feeling to play a PPG wave again! The sound got more power then I remembered. OK, some more zipper noises and audible steps in the wavetables scanning too. 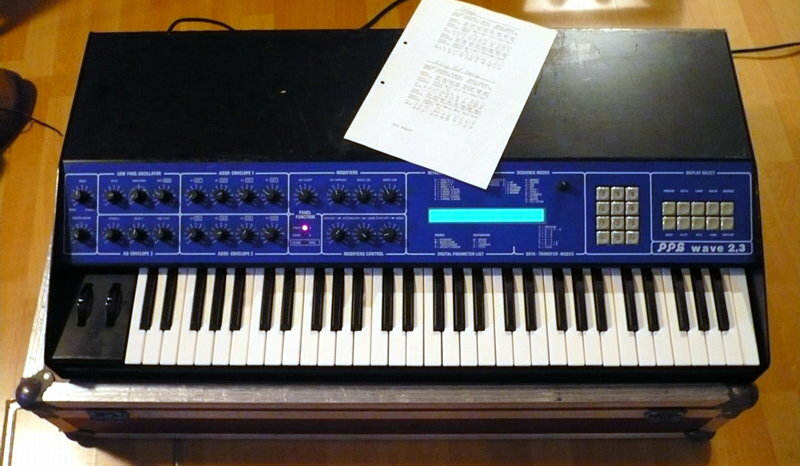 This PPG wave 2.3 is equipped with factory Midi. The new post PPG OS version 8.3 is installed to fix a few little bugs and to add Midi Sysex in- and export. And the keyboard bushings had been exchanged. So the keyboard is not looking like a mountain panorama. The back-up battery is exchanged. The display got a new backlight foil. It was a good idea to print a few of those list around the display. For example learning all the different keyboard modes by heart or using the manual every time wouldn't be so good. The wave 2.2 and 2.3 use the SSM 2044 filter chips. And the wave 2 the CEM 3320. This is often mixed up. But it is like this. Just open the waves and see inside. Or trust the service manuals/schematics that are found in the internet (at least the wave 2.2 and 2.3 versions). Both synths play back the wavetables using a 8 bit depth. Only the sample playback of the wave 2.3 is 12 bit. The waveshapes are stored in 128 samplewords. To save room only half the cycle, 64 sample words, is stored with 8 bit depth. The other half is mirrored from the first half. Due to the single cycle nature, there this is no quality loss resulting from this. The two oscillators are added by time multiplexing. The second oscillator is slightly lower then the volume of the first. This is due the different number of time slots in the multiplexing. The PPG waves sound different then the Waldorf wavetable synths (not including the Waldorf PPG wave VSTi), no matter how you adjust them. This is due to the strange envelope scaling of the filter/wavetable envelope and the special high frequency accumulation oscillators that do not run on a fixed sample rate like 44.1 kHz. This is one of the main differences from the Waldorf plug-in PPG 2.V and 3.V. You may get some sounds close enough on the Waldorf wavetable hardware synths, but certain steppyness and aliasing would not sound the same. But if you never played the real thing, you might not notice the difference at all. There is no antialiasing filter after the DACs which run straight into the SSM filter of the wave 2.2 and 2.3. So be warned, there is plenty of aliasing beyond your hearing range if the filter is fully opened. You might need to filter these out before using compressors or not well designed digital audio gear. 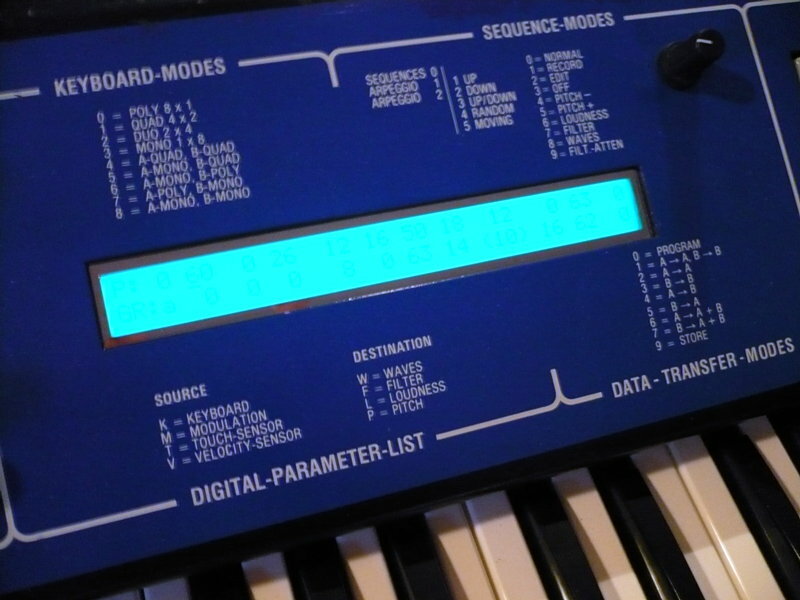 The Sequencer is not a realtime sequencer. It got always some strange way of quantisizing with a value that has to be set before you start to record. The PPG waves do not have a velocity sensive keyboard action. But the accept midi velocity input. The VF (velocity on filter) and VL (velocity on loudness) has to be switched on in the digital page of every sound before using velocity. If one of these parameters is set to 1 (=on), then the aftertouch value present at the moment when pressing a new key is used as velocity value. And it works per note. So you get some polyphonic aftertouch like things, and not a velocity sensing at all. But remember, the value is not changing during the length of each note. So you cn't fde in notes using this feature. But you can accent individual notes. You need to adjust your playing style to get this right. You don't see many PPG wave users, ncluding me, using this feature. You can set the PPG wave 2.3 into the 2.2 mode. This gives you acces 100 program slots (wave 2.2: 0-99 / wave 2.3: 0-87).But beware of this trap: if you use the 2.2 mode to store patches in the slots >, then these are partly overwritten by the combi (multi) page setting of the 2.3 mode. The wavetable can be selected only in the 2.2 mode (ups!). There are only 4 detune values (1-4). The other settings are 0 (no detune), 5 (a quint), 6 (one otctave and 7 (two octaves). So if you need to get some different detune, you may use a slow envelope 3 on the pitch of one oscillator (so either E0=1 or ES=1). You can't get an static off-set by this, but a fast to slow change of the pitch of one oscillator relative to the other. This changes the detune to some other then the static and always the same most often used values 1-3. 16 parameters if you count them all. But adjusting the semitone per available hardware voice (= 8 parameters) does equal most of the times to your synths octave selecting (=1 parameter for these 8). So you might consider counting only 9 parameters here. And the BI (Benderintervall = pitchbend range) is here and in the Digtal Page before. So we have to subtract this. 21 parameters plus the stored position of the mod wheel (the only way to adjust modulation depth in the whole synth) as to be add. Count the ones available in your later then mid eighties polysynth. This is not an impressive number compared for example with a Waldorf Blofeld or a Yamahy DX7. But these paramters are easy to reach without a deep menu structure or hidden values. And these parameters all make sense. So only a few of them are not used often. And there there is no build in FX, so no parameters for this. And somehow, these few parameters are more fun to tweak then a hyper complex machine like an Alesis Andromeda A6 with its way over 100 parameters. Of cause there was a reason for this limited number of parameters: the digital technique was to expensive then to add more. The price tag of a PPG wave 2.2, when released, was about the same as for a new car. And I a m not talking about a very cheap car. And even adding analog features and parameters like user selectable panning would have add to the cost noticable.